Saturday's powerful earthquake spread horror from Kathmandu to small villages and to the slopes of Mount Everest[$，] triggering an avalanche that buried part of the base camp packed with foreign climbers preparing to make their summit attempts. 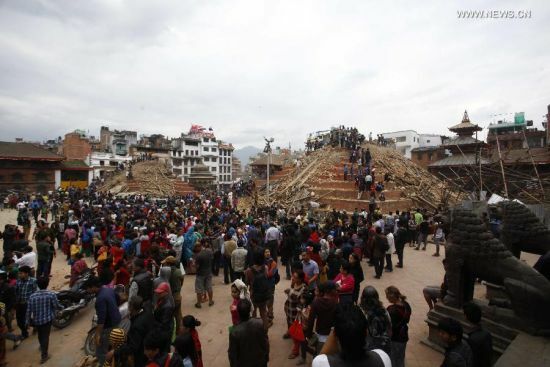 China has evacuated more than 4,000 people trapped in a border town in Tibet Autonomous Region due to a high risk of landslides in the area following the powerful quake in neighboring Nepal. Around 1.7 million children are now in urgent need of aid in the worst-hit areas by the massive earthquake in Nepal, according to UNICEF. Two Republic of Singapore Air Force (RSAF) C-130 aircrafts departed for Kathmandu on Thursday morning at about 5 a.m. and 11 a.m. respectively, Singapore's Ministry of Defence (MINDEF) said in a news release.